Well sometimes reality doesn’t meet expectation but this week did, spectacularly so. As you may recall last week I said I was expecting a much easier week leading in to the Interclub State Championship race on Sunday. That was certainly what was delivered but not in the way I would have liked. Monday was greeted with a bit of a lie in, well perhaps not to most but getting out of bed at 7am is pretty luxurious based on the last several weeks. When I got up though I just felt a little off. Sore legs, sure but that’s been pretty usual for a Monday morning, it was more of a foggy head than anything else. The ironman panic sets in…please don’t be getting sick! Of course it was a rest day and there’s not a lot you can do about illness, and better now than in a week’s time. Rest up, drink lots of water, eat well and wash your hands a lot. Give yourself the best chance to fight it off quickly if it is something coming on. 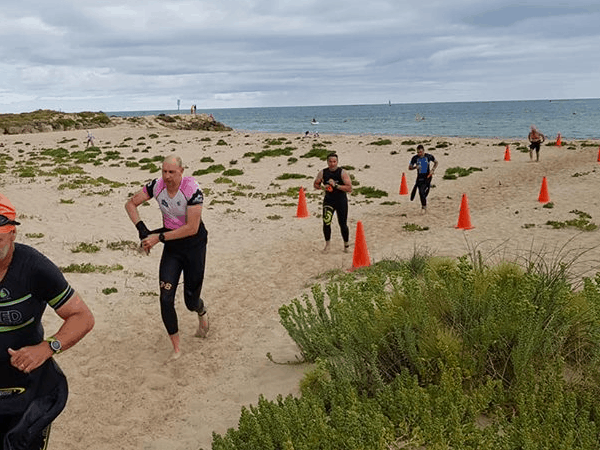 Now don’t get me wrong, I really love Ironman Western Australia (and the Busso Half in May) but the WA State Interclub Championships really get me excited. You see, I’m not a huge fan of taking races too seriously. We mostly do this stuff for a bit of fun so when I see people at races that seem to be not enjoying themselves or putting too much pressure on to perform I get a little cranky. Don’t get me wrong, Interclubs are serious business and I probably push myself as hard there as I do anywhere (while telling everyone I’m just going to go Ironman race pace) but success is measured by team success not the individual. For some clubs that means winning one of the two trophies on offer while others might consider building team morale to be far more important or even simply getting some club-mates through their first attempt at a sprint distance race. To borrow a cliché, everyone can be a winner. So we all managed to dodge the wet weather which set in not long after the race was over and as a club we had some pretty impressive performances. I think there were a number of race PBs (personal bests) in the group and a great feeling of camaraderie not just within the club but between everyone there. Interclubs serves another purpose for me. I’ve done the race all bar one year before tackling Ironman WA and I’ve found the ratio between my result there and my final time a week later always falls within a fairly narrow band. Now I’m not going to suggest that I have a goal time for next week as there are simply too many variables that are out of my control but I can at least be fairly confident that it won’t be a terrible race for me. 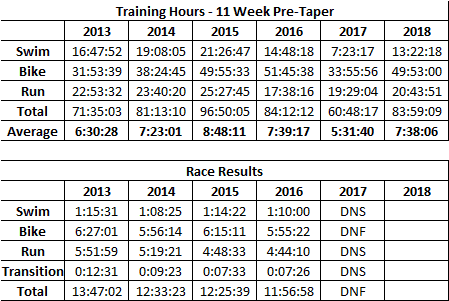 So leading into my one week taper (given this week’s effort I feel like I’ve already done it) I thought I’d take a look back to see how the training compares to previous attempts at this race and the results were somewhat suprising. I don’t have records for my first attempt in 2011 but you can see that in terms of the eleven weeks leading into taper I’ve actually done okay compared to normal. In fact it’s almost spot on my second best lead in which ended up with my best result to date. Of course that sub-12 hour result was helped greatly by excellent conditions on the day and the consistent training that I’d already put in prior to that build so there’s no suggestion it’s in danger of being bettered. I guess the other thing this might hopefully tell some of you is how achievable Ironman can be within a relatively normal life. I’m certainly no great natural athlete, as a child I had to attend Horse Riding for the Disabled because of a sever lack of co-ordination. What I do have come race day though is a bit of pig-headedness and a will to just keep moving forward. There’s no magic or rocket science to finishing, it’s just one stroke, revolution and footstep after the other until you’re done. It will all be fairly easy training and all determined by how I feel until Thursday when we head to Busselton. After that I have a little training routine that I try and follow, one that is almost second nature to me now. I also use the week down there as an opportunity to catch up with a lot of people that I don’t see too often and to socialise. The work is done. The result can only be negatively affected from here on in if you do too much or let the nerves get to you. It’s time to relax and enjoy what we’ve built.